The Protection stage allows the IP Commercliaisation Team and professional agents to review the novelty of the IP and critically evaluate it. Potential mechanisms for protecting the IP will be considered. Formal IP registration will be considered and the best fit for each idea adopted. Occasionally, progressing an idea without formal IP registration, may be the prefered option. Options will be considered for the optimal protection mechanism for each disclosed idea. Protection budgets will be calculated and investment sought. 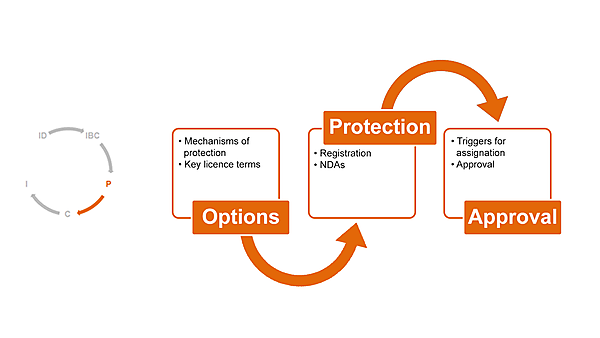 Where formal registered protection is deemed to be the preferred option, (subject to institutional priorities and funding) measures will be taken to protect the IP. Where non-registered protection prevails a bespoke strategy will be developed. Approval to proceed will be based on the initial business case and the strength of the protection secured. Triggers for IP assignment will also be identified where a spin-out company is licenced to exploit UoP IP.